When Jason Hornady was hired by his father, Steve, in 2006, he was given several goals to accomplish. There were programs that had to change and an export business to fix, which were all tasks completed several years ago. The most challenging objective given to Jason was to win an FBI contract. That just happened. Hornady was founded by Jason’s grandfather, Joyce, in 1949. When Jason joined the family business in 2006, Hornady had just finished development of the then-new LeverEvolution bullet. 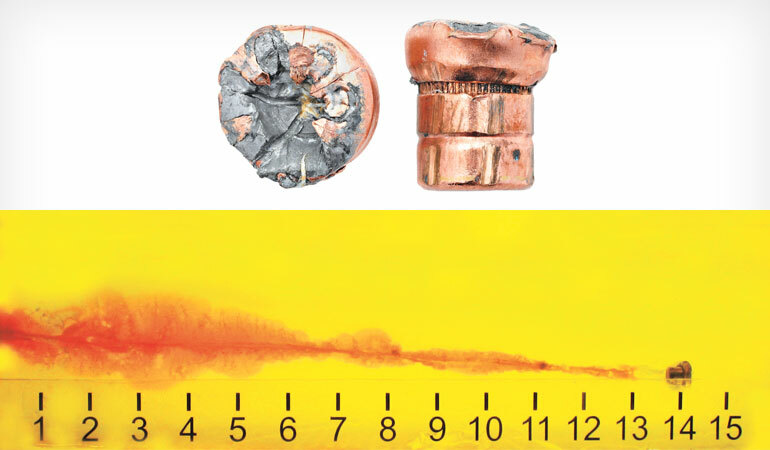 LeverEvolution was an offshoot from the technology earned through previous attempts to develop a handgun bullet that would pass all six of the FBI’s protocol tests. Hornady’s ballistician that led those efforts was none other than Guns & Ammo contributor Dave Emary. AUDIO INTERVIEW BELOW: Jim Bequette interviews Jason Hornady about their contract with the FBI. Emary first had an idea for the polymer-tip design in 1996. By 1997, he was experimenting with hard-plastic tips inserted in a bullet’s hollowpoint to give it the penetration akin to a full metal jacket (FMJ). The problem was, it’s terminal ballistics were as poor as an FMJ in that there was little expansion. In 1999, Emary drilled out .45-caliber XTP bullets and filled them with silicone, bath-tub caulk. After experiencing better results than his hard-plastic-tipped bullets, Emary went to Steve and said, “This works really good!” Steve replied, “So, how do we mass-produce that?” There wasn’t an easy answer. Circa 2003, Emary started working earnestly on a bullet design that would meet the FBI protocal for performance through steel and not get destroyed by glass. The most challenging part of the FBI’s tests was shooting through glass and achieving between 12 and 18 inches of penetration. (Ideally, 15 inches.) The solution wouldn’t reveal itself for several more years. Along the way, Emary found that his rubber-like tips worked great in rifle bullets, which sidetracked the project into the development of LeverEvolution. What made LeverEvolution revolutionary was Emary’s flex-tip (FTX) technology. 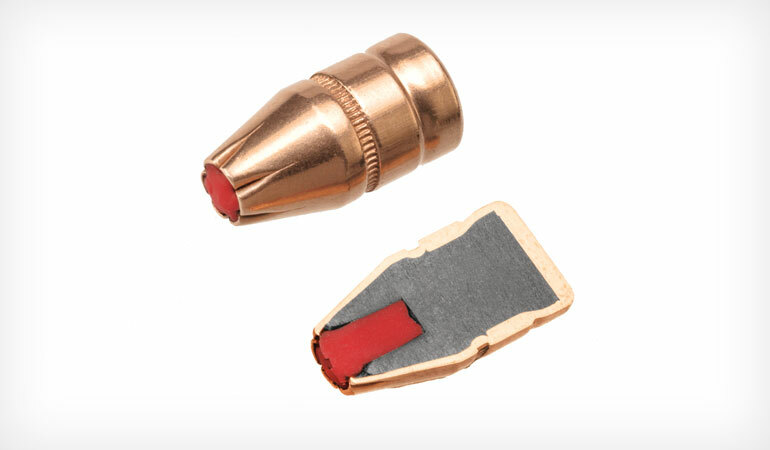 The key to FTX (and MonoFlex) bullets is the elastomer tip that made traditionally flat-nose bullets pointy. 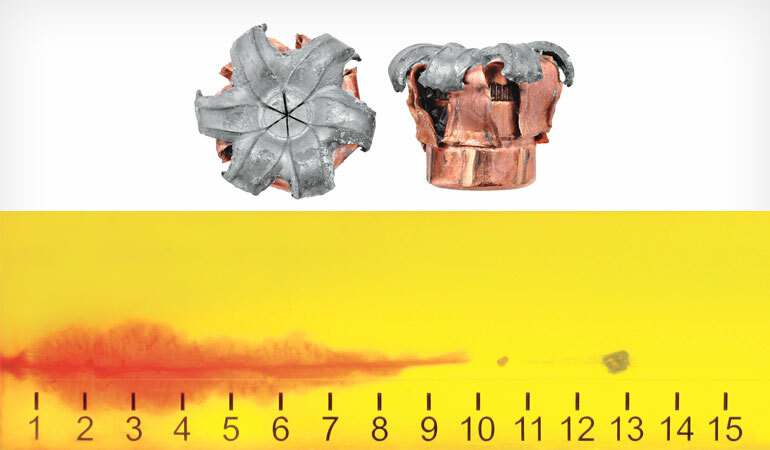 Ballistic coefficients (BC) were improved and FTX made pointed bullets safe for use in tubular magazines. The FTX’s signature red tip isn’t hard enough to crush the primer of the round ahead of it. This meant that a levergun’s accuracy potential increased as the trajectory flattened for extended range in the field. 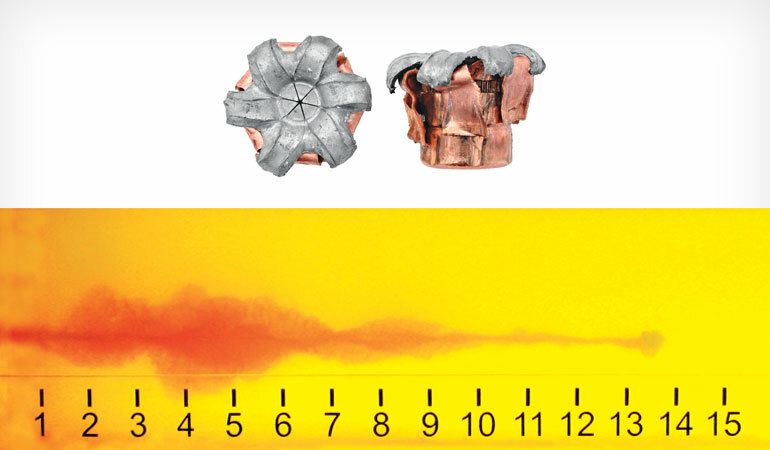 G&A’s testing at that time saw velocity numbers increase as much as 250 feet per second (fps) over traditional flat-nose bullets and weight retention improve to transfer more energy on target. 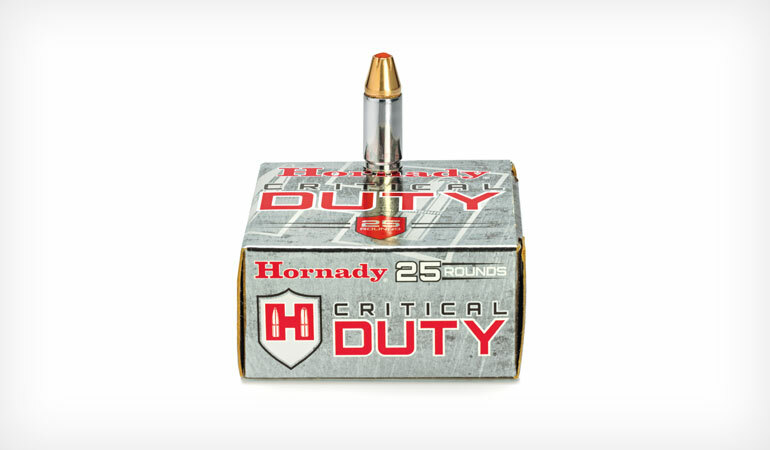 The story of Critical Duty began with a conversation between young Hornady and Emary. By 2006, Emary wasn’t sure that they could ever use the technology to survive the FBI’s tough testing protocol. Undaunted, experimentation resumed. Until ’06, Hornady’s only .380 ACP load was a round-nose FMJ, but the team had managed to put the FTX technology in a new .380 ACP load. Thoughts of passing the FBI project were shelved as Hornady pursued developing a new bullet for the concealed-­carry market for two years — and interest in .380 was hot. To help the market understand that FTX wasn’t simply a hard-plastic tip inserted in a hollow cavity, Hornady started using an effective analogy that related it to putting a pencil eraser in the nose of a bullet. Unfortunately, some media convinced readers that Hornady was using real pencil erasers, which they were not. (It would take a few years to re-educate the masses.) However, there was genuine excitement for personal-protection ammunition once images of its expansion and penetration after passing through thick clothing like leather and denim were circulated. It took two years to design a jacket that wouldn’t simply fumble the flexible tip once it made contact. The solution to the problem was solved with Hornady’s investment in new tooling and with some crafty engineering. The tooling allowed Hornady to move metal during mass production in ways never imagined. There are still some secrets on how Hornady makes these bullets, but I can tell you that they abandoned bonding from the get-go. 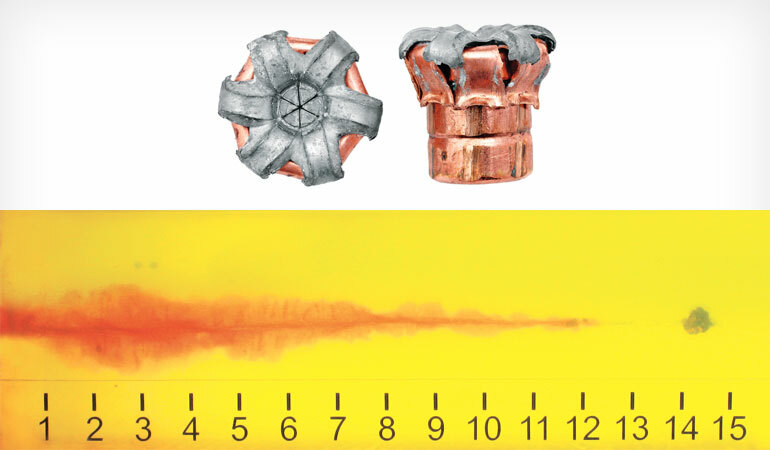 The newly formulated polymer-tip prevented the hollowpoint from being plugged with clothing, which helped to ensure consistent expansion. Critical Defense was born. Introduced in 2008, Critical Defense was initially launched in .380, .38 Special, .38 Special +P and 9mm to much fanfare. Unfinished Business Steve’s list was almost complete, but the challenge of obtaining an FBI contract still loomed for Jason. 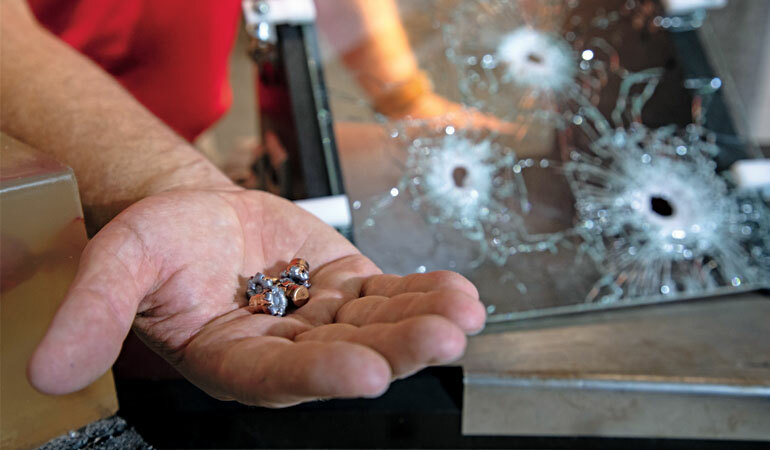 Though Critical Defense was receiving accolades commercially, it wasn’t reliable enough for the law enforcement community’s needs when tested against auto glass. The bullet produced a huge frontal area and quickly shed velocity in gelatin. The FBI demanded more penetration — 12 to 15 inches, at least. Hornady was happy with Critical Defense as a product popularized within the concealed carry movement, but it was time to offer a purpose-built duty load. They needed a bullet that opened the cavity and swaged the lead with delayed expansion. Capping such a bullet with a polymer tip almost did the trick, but they needed a heavier copper jacket with an interlock that the hard lead core could not get past. 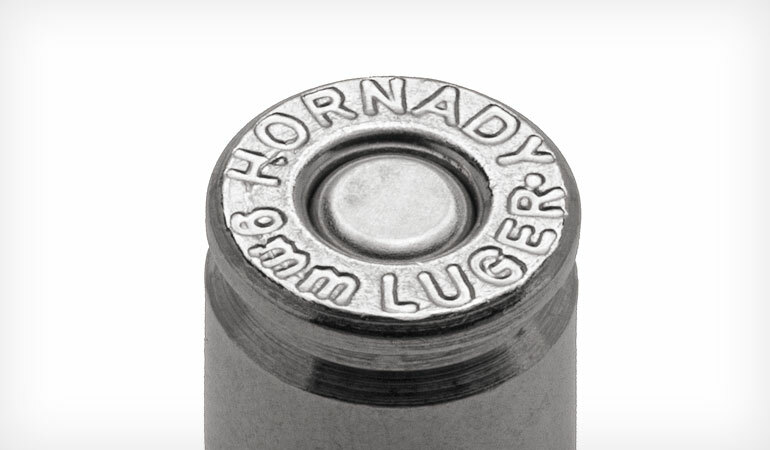 Adding Hornady’s flexible polymer-tip technology allowed initial expansion to be delayed long enough that it helped the rest of the bullet stay together, even at low velocities. Barrier: Plywood; Penetration (in. ): 14.5 in. Once the resulting bullet lost its polymer material, they had a wadcutter coming out of the backside of the glass. It lost a little weight, but penetration was gained. 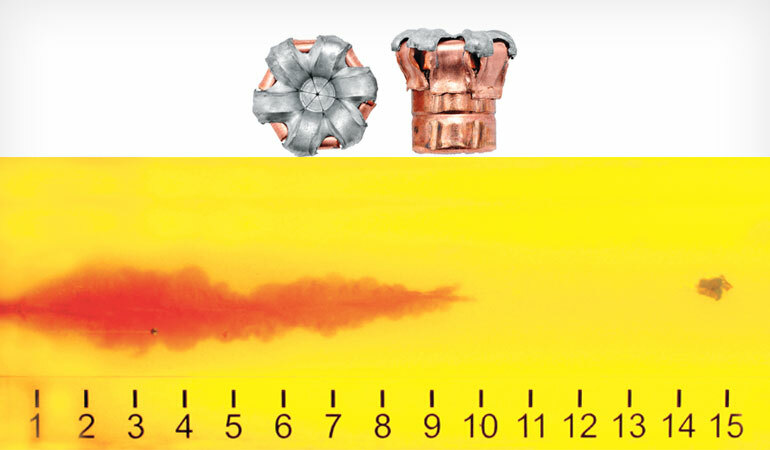 The 9mm bullet became a 135-grain bullet due to incorporating the flexible tip and the 9mm’s overall length limitations. However, it uses more copper to secure the lead core and benefits from a large interlock. 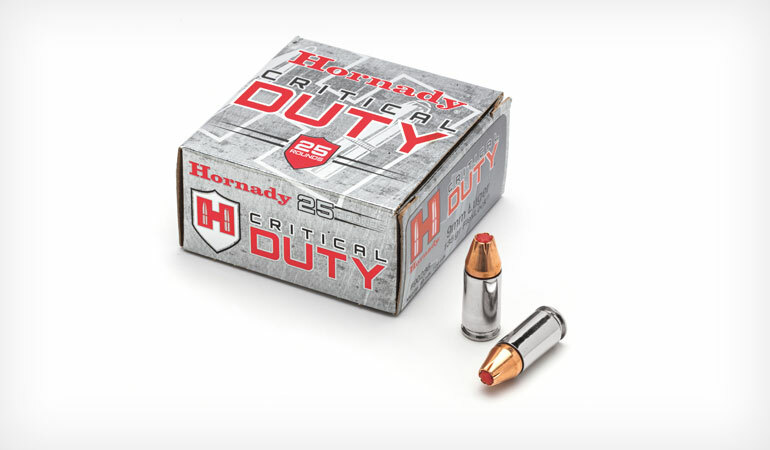 During Critical Duty’s development, Hornady also drove the handgun market to produce pistols with faster twist rates. Critical Duty was an elegant solution. The new jacket design combined with the polymer tip gave everyone the weight retention and penetration they were looking for. Putting the shear point on the tip of the petals of the bullet’s nose meant that it consistently maintained 60 percent of its weight as it traveled to its final destination. In June 2012, Jason Hornady took Critical Duty to his father, Steve, who was reluctant to release it until more testing could verify it wasn’t inferior to another bullet. However, Jason knew that Steve wanted to launch Zombie Max, which Jason was apprehensive about. A deal was made and both were sent to market. Zombie Max became a success story, but so did Critical Duty. Steel penetration was a breakthrough, because steel usually crushes hollowpoints closed as they pass through it. That turns many bullets into something like an FMJ followed by 20 inches of penetration when referring to 9mms. That’s called overpenetration. The FBI is never wild about that. 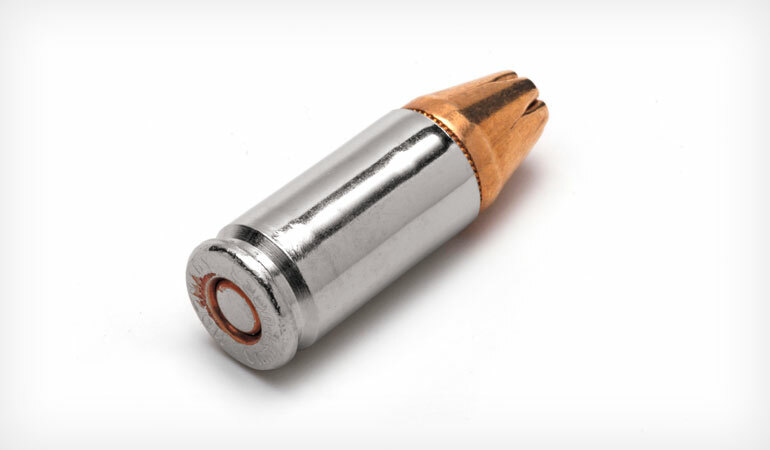 Through steel, the bullet first flattens like a pancake and then mushrooms around the polymer tip, which means there’s more frontal area and the bullet mimics expansion. Sometimes steel captures the tip like a cap on top of the bullet. In plywood, drywall and heavy clothing, it functions like a traditional hollowpoint, but is captured between 12 and 18 inches in gel. It really is barrier blind. Two years later, the FBI requested loads for a .45 ACP contract. 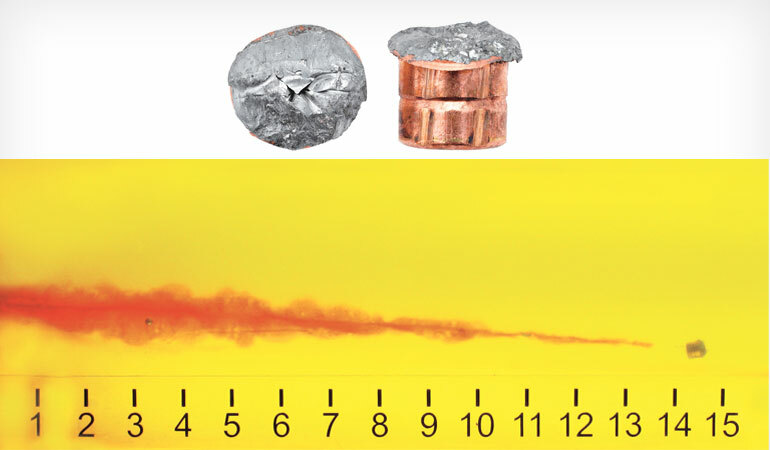 Hornady made it through initial testing but the FBI stopped and canceled the entire project after high-performance loads were too hard on the FBI’s Model 1911s. Then the .40 solicitation appeared and Hornady scored their first acceptance in the number two seat, splitting the contract with Winchester. Then the 9mm announcement was made. Penetration has to be just right after passing through a barrier to meet the FBI’s strict standards. Here, Jason Hornady (right) works with a ballistics technician to measure one of the many blocks of gelatin used to validate research. Critical Duty had launched commercially in 2013. 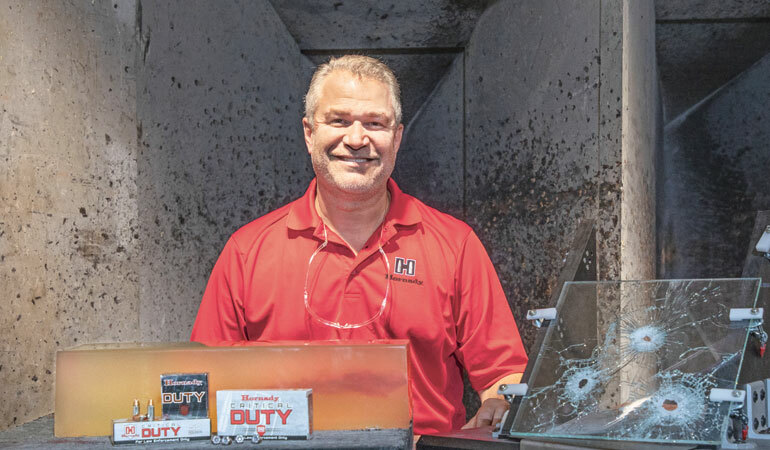 At that time, Hornady didn’t think that their small-business size and capabilities were where they needed to be to win. Still, they made samples and worked to enhance their business profile. Jason even hired an expert on government procurement to help better position themselves. 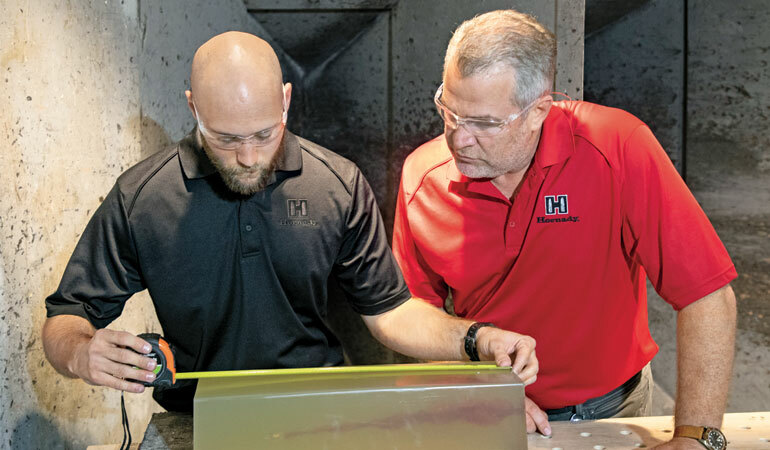 Testing at Hornady continued, and the result required a tweak to the hardness of the lead in Critical Duty to consistently pass the FBI’s penetration testing protocol and meet the agency’s new power factor standards. By 2017, the FBI had selected the Glock 17M and 19M, variants of the G17 Gen5 and the G19 Gen5 in 9mm, and they quickly needed a new duty load. Phase one was all paperwork and written proposals. Phase two is where testing began to include pentration protocols and velocity testing. There’s a velocity window and a power factor that weeds out most entries at this point. Then follows scoring for muzzle flash and accuracy that kicked out many makes and models before the FBI selected loads in 9mm and .40. At the end of phase two, two ammo companies remained. Phase three was a head-to-head competion that involved a 10,000-round function test. Carried out in secret, the ammo brands didn’t know who they were competing against. Phases one through three were completed in about six months at the FBI’s ballistic center in Quantico, Virginia. It was at the ballistics center that results from muzzle energy, penetration, accuracy, temperature sensitivity (-40 F to 140 F) and weight retention were measured and put in a scoring matrix. The FBI observed that bonded bullets beat Critical Duty a little on glass, but Critical Duty beat everyone on uniformity. Ultimately, the contest came down to performance through glass where Critical Duty’s uniformity, terminal performance and accuracy won the day. Notably, the FBI reported that the Critical Duty 9mm 135-grain load was the most accurate 9mm round that they had ever fired. The Critical Duty ammo that the FBI receives is slightly different than what we can buy commercially. The difference? The FBI gets it in 50-round packages instead of 25. You could say we’re all winners. Jason Hornady met his father’s goals and we all have access to a proven barrier penetrator.